MI PUEBLITO: Occupying several acres in Panama City, this is a must-see demonstration of Indian culture and of black culture in the 1950s. The name means My Tiny Village, and the site contains several replica houses. Those that might have been occupied by black Panamanians are furnished as they would have been in the 1950s. 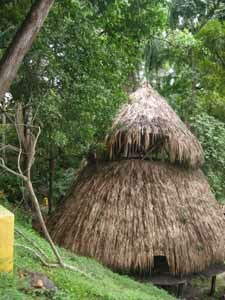 The native Indian thatched homes in their jungle-like setting in Mi Pueblito display nothing in the way of furniture, other than a few clay pots. Raised well above ground level for protection, they are entered by means of a removable notched log placed at an angle from ground to floor. The floor itself is made from thin planks that give when stepped on. It is difficult to do this silently. All members of the family slept on the floor. A Kuna Indian who sells handicrafts at Mi Pueblito demonstrated how a wife is won, and the dangers associated with courtship. The suitor would wait until he thought the family was asleep, then creep across the floor to where his intended was sleeping. If he was able to bed her without waking other members of the family, she was his. If he was unsuccessful, he could be killed. narrowly escaping the wrath of her father. One of the thatched structures has two floors, the upper level being for storage of musical instruments out of reach of children. 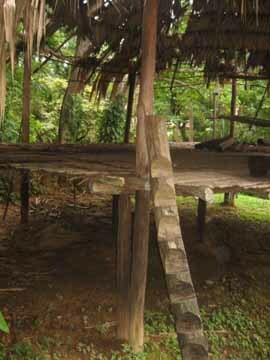 A large thatched meeting hall is in use today in Mi Pueblito. It and its contents are built without nails or modern tools. 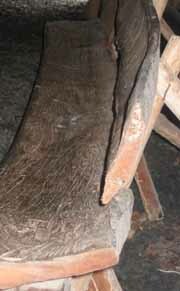 Benches are hewn from large trees using nothing more than sharp stones. The result is quite remarkable. Many of the Indians at Mi Pueblito make a living by selling reasonably priced handicrafts. There are displays of intricately carved and painted animals, butterflies, fish and reptiles, carved from small tagua nuts. The nut has similar properties to ivory and it just as durable. The masters of this art are the Wounaan Indians from the jungles of Darien Province, on the dangerous border with Columbia. With no formal training, they carve what they see in the wild. 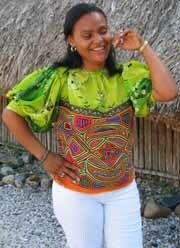 A Mola, in the Kuna culture of the San Blas Archipelago, is a traditional blouse worn by women. These blouses are available at Mi Pueblito, as are the panels that decorate them. Each decorative piece is made from two intricately appliquéd panels. They are collectors’ items, available for a few dollars here, San Blas, and at selected stores around the city. So much true talent is on display that you could easily spend hours admiring it. Mi Pueblito is a calm oasis in a city busy with noisy traffic. There’s a restaurant, a coffee shop and many places to sit, relax, and watch the wheeling eagles. Admission is $2, and worth every penny.